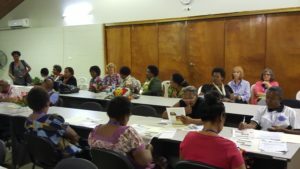 The Crawford Fund has a long association with PNG Women in Agriculture, having connected with the group through Australian Women in Agriculture and having supported training for them in leadership, communication and floriculture skills. Most recently, we supported Dr Norah Omot of the National Agricultural Research Institute of PNG (NARI), and Dr Adele Feakes and Dr Wendy Lindsay (both of the University of Adelaide) to survey the group for their entrepreneurial skills. Such skills are important to the success of the group and farmer members. Prominent PNG Women in Agriculture are highly entrepreneurial. This was one of the results found from the survey undertaken by 47 women and 3 men attending the PNG women in agriculture bi-annual conference in October 2015 in Lae (see images right and below). Positive responses were stated for confidence in business and entrepreneurial practices for farmers and non-farmers (e.g. NGOs or government agricultural research and extension officers). This finding of high entrepreneurial self-efficacy (ESE) is of importance to the aims of the National Agriculture Development Plan (NADP), as these women (and three men) are respected leaders in their communities and will act as role models. Survey analysis revealed that for women respondents, social approval does not appear to affect business start-up intent, nor their overall confidence in business and entrepreneurial self-efficacy. It could be regarded as a positive that social norms do not appear to affect the confidence that PNG Women in Agriculture have in their financial skills and entrepreneurship. This is because social norms affect levels of confidence in the ability to business plan (planning ESE), assemble appropriate resources (marshalling ESE), and organise people (people implementing ESE)—three of five specific dimensions of entrepreneurial self-efficacy. 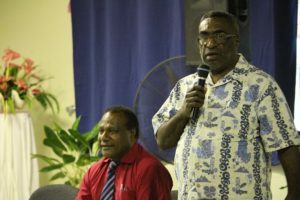 Dr Sergie Bang, Director of the National Agricultural Research Institute of PNG (NARI) (left) and the Honorable MP Kelly Naru, Governor of Morobe Province (right) at the PNG Women in Agriculture meeting held 19-22 October 2015, Lae, PNG. 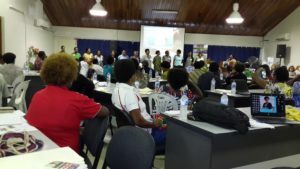 A training program has been proposed for PNG Women in Agriculture, with particular emphasis on the areas in which they noted lowest self-confidence—financial implementation and business planning. Participants expressed an overwhelming interest and enthusiasm to attend a three day business planning workshop in the future. The investigators, Dr Norah Omot (who was a speaker at our 2014 conference), Dr Adele Feakes and Dr Wendy Lindsay, hope to put together a proposal with PNG Women in Agriculture to take this research forward to the next phase.